If you are looking for a TV show tracker that is as elegant as it is useful, look no further than CLIFFHANGER. 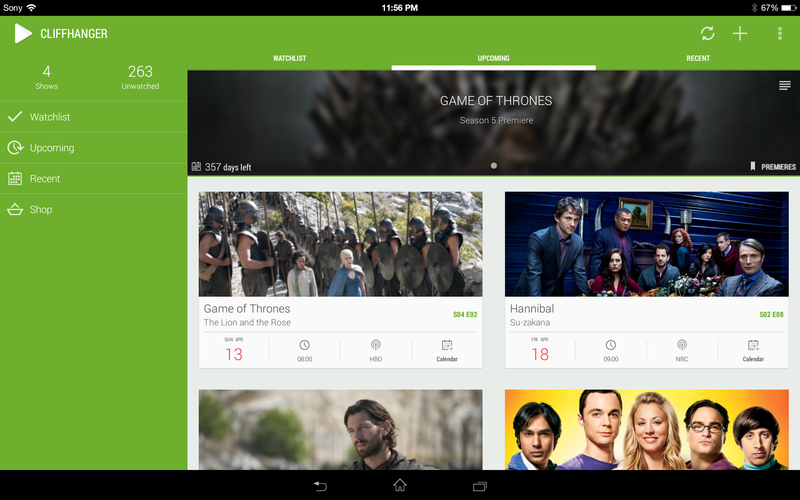 The CLIFFHANGER app is designed to make keeping up with your favorite TV shows a breeze. CLIFFHANGER is beautiful to look at and a joy to use. It is designed to give you all the content you need in one place. When you open the app for the first time, you are greeted with a blank canvas so to speak. There is a bar at the top of the screen that displays trending shows, giving you ideas of shows you may want to keep track of. If you already have your list together, you can just press the “+” on the top right and start inputing your favorite shows. The app can also sync with Trakt.tv if you are inclined to pay for the premium pack. Once you get CLIFFHANGER filled with your shows of choice, you gain access to a wealth of information about each TV show. Everything from season and episode lists, IMDB database information, ratings, and comments. You can tap the “upcoming” tab to see your shows in the order they will premiere on television. The “recent” tab lists shows that have already aired. You can also “check off shows that you have watched”, and be notified when new episodes are airing on television. CLIFFHANGER is as beautiful as it is useful, and is optimized for phone and tablet. The free app currently has a 4.4 rating in the Play Store, and recently got a UI overhaul to make it even more beautiful, without getting tin the way of its utility. I personally use this app to keep up with my family’s favorite shows, and suggest that you give it a whirl to see what the buzz is about. 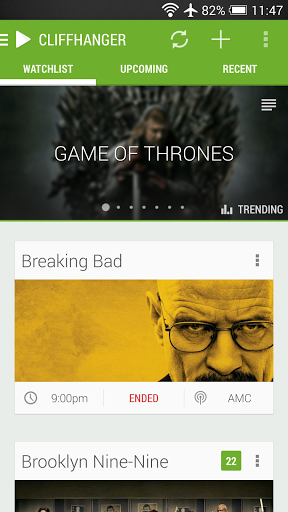 The post CLIFFHANGER keeps you up to date with your favorite TV shows [App of the Day] appeared first on AndroidGuys.